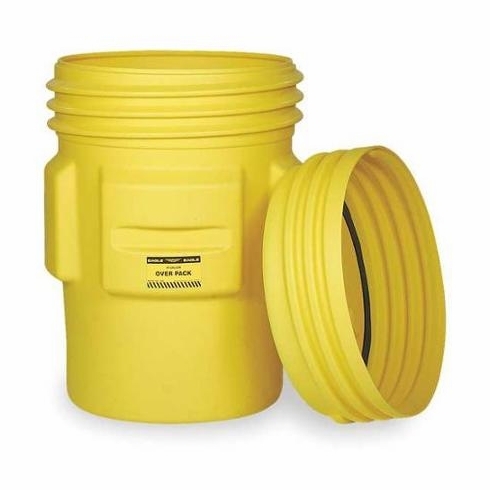 Description: The Eagle 95 Gallon Overpack Drum is constructed of yellow blow-molded high-density polyethylene (HDPE) with UV inhibitors, is durable and lightweight, weather and chemical resistant, and has a yellow screw-on lid. Constructed of chemical resistant high density polyethylene. Lightweight, nestable and includes UV inhibitors. Ideal for storage, transportation, cleanup and spill containment. Drums incinerate completely. Forkliftable. This 95 gallon overpack holds 55 gallon drums or smaller. UN certified to HM-181. Can be used with packing groups I, II and III of hazardous material compliance: Overpack DOT 49CFR 173.25. Un rating 1H2/X340/S.